Mirror Mirror on the Wall….not always in decor! MIRRORS are my secret weapon when it comes to decorating!!! They are definitely one of the most versatile objects you can use in décor and are my ¨go-to¨ piece when I want to make a statement, dress up a room or illuminate a space. So many times, we forget that mirrors are not only functional, but also decorative, and you do not always have to sacrifice one for the benefit of the other. They come in all shapes, sizes, materials and styles – modern, traditional, transitional, classic and everything in between!!! You can hang them, create a wall with them, or stand them up. With just a little bit of creativity, the options are countless! 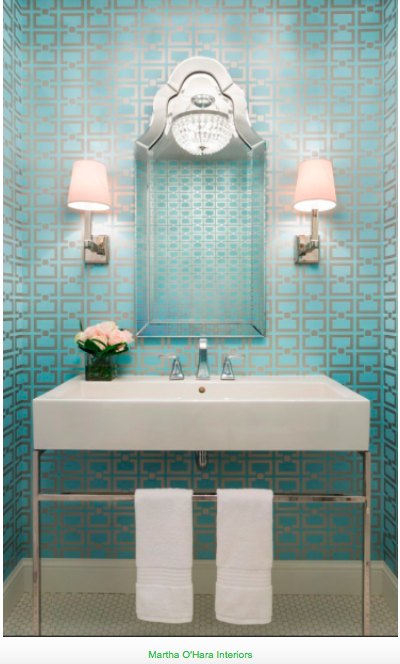 Make a statement – use a mirror with a funky shape, size or finish for the powder room. No rules apply here, so get eccentric and have fun with it. I also love them to make a statement in the entryway or over a mantle…pure impact! Use them as wall art – I always look for vintage mirrors at antique fairs. The last time, I found an amazing series of three that I used to hang over a living room sofa. With their unique character, they became THE conversation piece. Style up your bathroom – forget the wall to wall mirror over the vanity (been there, done that). For a twin vanity, use two elegant mirrors, adding a touch of glamour and giving the space a new style and personality. Add depth and dimension to space – ideal in a narrow hallway or a small dining room. Reflect beauty and create special effects– hang them strategically to reflect a spectacular view of the sea, garden or city skyline. It is like adding a beautiful painting to your room. Reflect light in a dark space – a standing mirror is ideal to reflect light in a dark room, lightining it up in a heartbeat. Pull it together or mix it up – the style you choose can either coincide with the style of the house to preserve continuity or it can disrupt it intentionally. I am a fan of disruption!!! My favorite is adding a Venetian-style or Art deco mirror to modern interior design. Define your space – depending on placement, a mirror can either open the space with dimension or define it. I use a large wall mirror in an open floor plan to define the dining area. Instant double duty, as it also reflects chandeliers, artwork and candles helping to create a romantic ambiance. A walk-in closet must – oversized floor mirrors give illusion of more space and provide more luminosity…not to mention a feeling of glamour. Feng Shui tip – avoid mirrors in the bedroom, as they disturb peace and disrupt restful sleep. 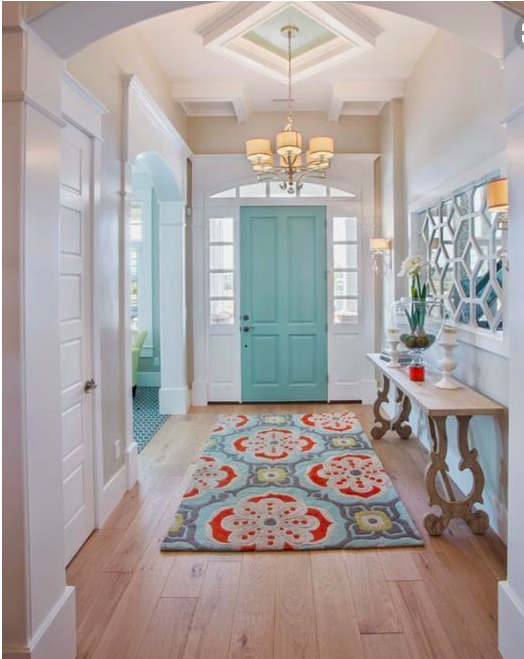 Love this entry with a decorative mirror from A Blissful Nest. Check out my Pinterest board for more ideas and inspirations on how to use mirrors in your home! As always, I love to hear from you, so please leave a comment below, and let me know your thoughts.